View More In Aprons - Page 5. Pusheen knows a thing or two about snacks - so who better to help you in the kitchen?? 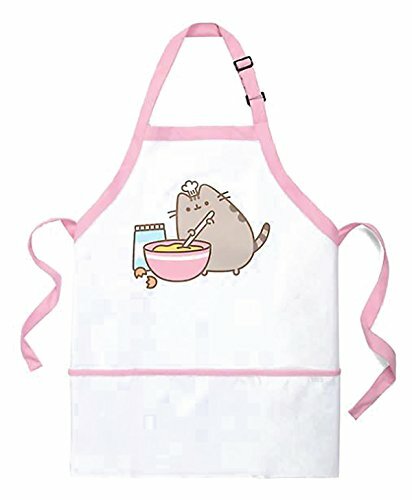 This adorable apron features pink lining and Pusheen baking up some yummy treats. Features supercute Pusheen mixing a bowl of chocolate chip cookie dough. Adjustable neck strap. Two waist ties. 100% cotton. Machine wash warm, tumble dry low. Select GIFT at check out to include your message. Pusheen knows a thing or two about snacks - so who better to help you in the kitchen?? This adorable apron features pink lining and Pusheen baking up some yummy treats. Features supercute Pusheen mixing a bowl of chocolate chip cookie dough. Adjustable neck strap. Two waist ties. If you have any questions about this product by Pusheen, contact us by completing and submitting the form below. If you are looking for a specif part number, please include it with your message.